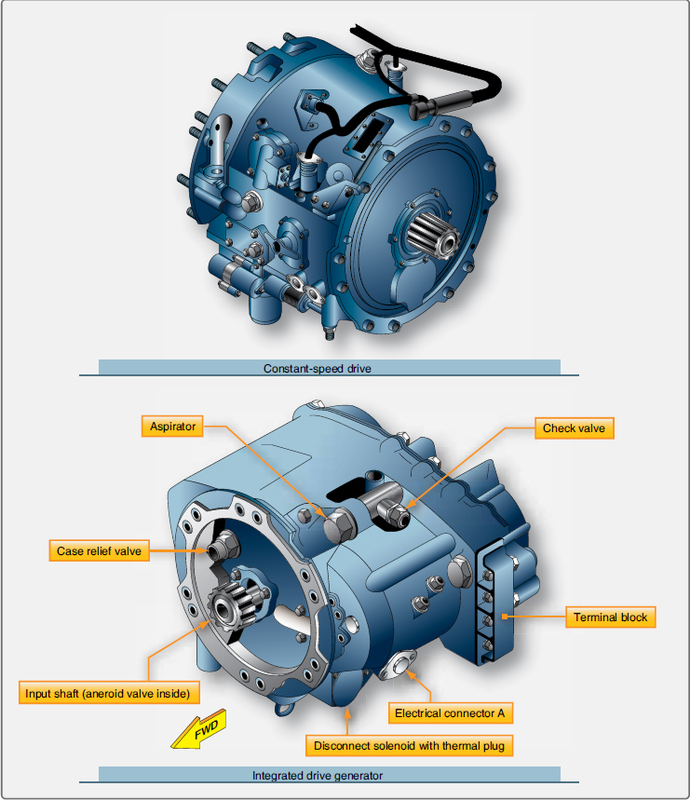 The unit shown in Figure 1 contains an alternator assembly combined with an automatic drive mechanism. The automatic drive controls the alternator’s rotational speed which allows the alternator to maintain a constant 400-Hz AC output. All AC alternators must rotate at a specific rpm to keep the frequency of the AC voltage within limits. Aircraft AC alternators should produce a frequency of approximately 400 Hz. If the frequency strays more than 10 percent from this value, the electrical systems do not operate correctly. A unit called a constant-speed drive (CSD) is used to ensure the alternator rotates at the correct speed to ensure a 400- Hz frequency. The CSD can be an independent unit or mounted within the alternator housing. When the CSD and the alternator are contained within one unit, the assembly is known as an integrated drive generator (IDG). The CSD is a hydraulic unit similar to an automatic transmission found in a modern automobile. The engine of the automobile can change rpm while the speed of the car remains constant. This is the same process that occurs for an aircraft AC alternator. If the aircraft engine changes speed, the alternator speed remains constant. A typical hydraulictype drive is shown in Figure 2. This unit can be controlled either electrically or mechanically. 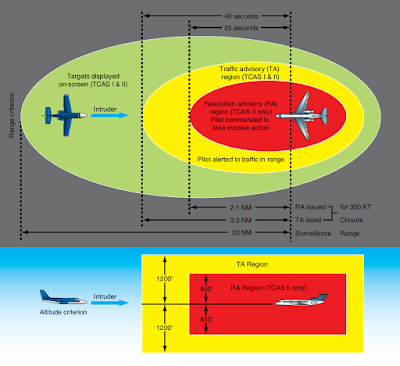 Modern aircraft employ an electronic system. The constant-speed drive enables the alternator to produce the same frequency at slightly above engine idle rpm as it does at maximum engine rpm. The hydraulic transmission is mounted between the AC alternator and the aircraft engine. Hydraulic oil or engine oil is used to operate the hydraulic transmission, which creates a constant output speed to drive the alternator. 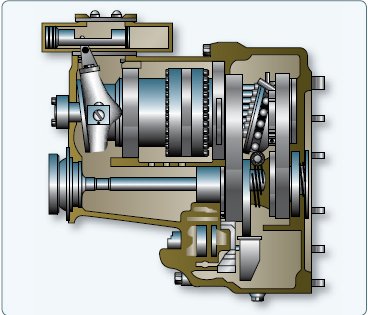 In some cases, this same oil is used to cool the alternator as shown in the CSD cutaway view of Figure 2, on the opposite end of the transmission, engages the drive shaft of the alternator. The CSD employs a hydraulic pump assembly, a mechanical speed control, and a hydraulic drive. Engine rpm drives the hydraulic pump, the hydraulic drive turns the alternator. The speed control unit is made up of a wobble plate that adjusts hydraulic pressure to control output speed. Figure 3 shows a typical electrical circuit used to control alternator speed. The circuit controls the hydraulic assembly found in a typical CSD. As shown, the alternator input speed is monitored by a tachometer (tach) generator. The tach generator signal is rectified and sent to the valve assembly. The valve assembly contains three electromagnetic coils that operate the valve. 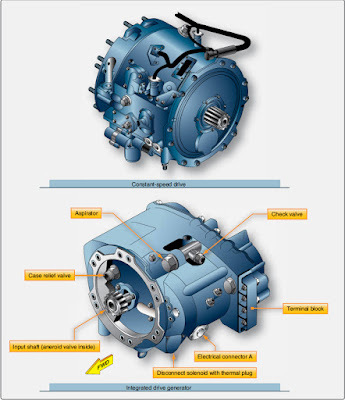 The AC alternator output is sent through a control circuit that also feeds the hydraulic valve assembly. By balancing the force created by the three electromagnets, the valve assembly controls the flow of fluid through the automatic transmission and controls the speed of the AC alternator. It should be noted that an AC alternator also produces a constant 400 Hz if that alternator is driven directly by an engine that rotates at a constant speed. On many aircraft, the auxiliary power unit operates at a constant rpm. AC alternators driven by these APUs are typically driven directly by the engine, and there is no CSD required. For these units, the APU engine controls monitor the alternator output frequency. If the alternator output frequency varies from 400 Hz, the APU speed control adjusts the engine rpm accordingly to keep the alternator output within limits. Modern aircraft that employ AC alternators use several computerized control units, typically located in the aircraft’s equipment bay for the regulation of AC power throughout the aircraft. 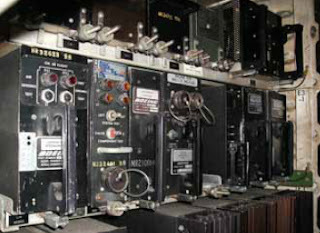 Figure 4 shows a photo of a typical equipment bay and computerized control units. Since AC alternators are found on large transport category aircraft designed to carry hundreds of passengers, their control systems always have redundant computers that provide safety in the event of a system failure. Unlike DC systems, AC systems must ensure that the output frequency of the alternator stays within limits. If the frequency of an alternator varies from 400 Hz, or if two or more alternators connected to the same bus are out of phase, damage occurs to the system. 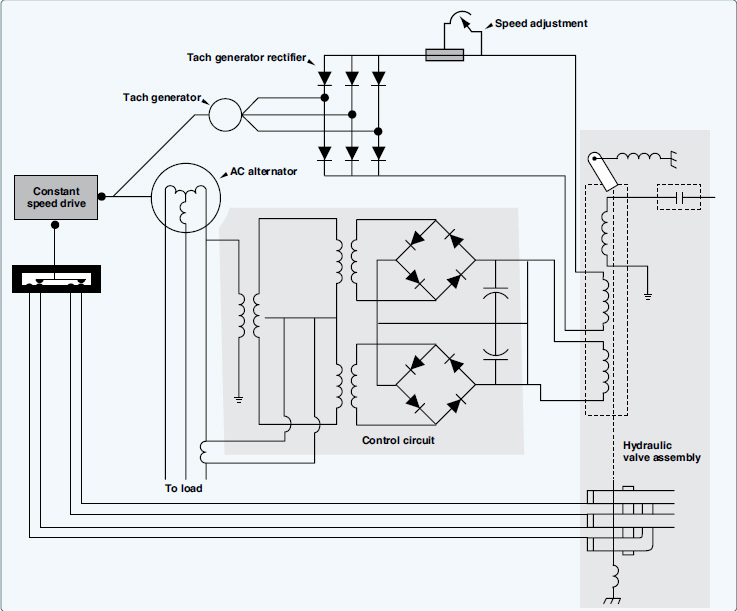 All AC alternator control units contain circuitry that regulates both voltage and frequency. These control units also monitor a variety of factors to detect any system failures and take protective measures to ensure the integrity of the electrical system. The two most common units used to control AC alternators are the bus power control unit (BPCU) and the GCU. In this case, the term “generator” is used, and not alternator, although the meaning is the same. The GCU is the main computer that controls alternator functions. The BPCU is the computer that controls the distribution of AC power to the power distribution busses located throughout the aircraft. There is typically one GCU used to monitor and control each AC alternator, and there can be one or more BPCUs on the aircraft. BPCUs are described later in this chapter; however, please note that the BPCU works in conjunction with the GCUs to control AC on modern aircraft. A typical GCU ensures the AC alternator maintains a constant voltage, typically between 115 to 120 volts. The GCU ensures the maximum power output of the alternator is never exceeded. The GCU provides fault detection and circuit protection in the event of an alternator failure. The GCU monitors AC frequency and ensures the output if the alternator remains 400 Hz. The basic method of voltage regulation is similar to that found in all alternator systems; the output of the alternator is controlled by changing the strength of a magnetic field. 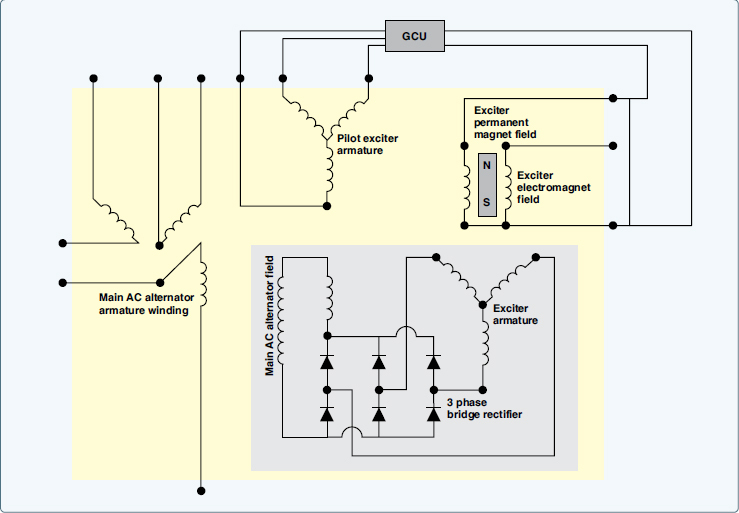 As shown in Figure 5, the GCU controls the exciter field magnetism within the brushless alternator to control alternator output voltage. The frequency is controlled by the CDS hydraulic unit in conjunction with signals monitored by the GCU. The GCU is also used to turn the AC alternator on or off. 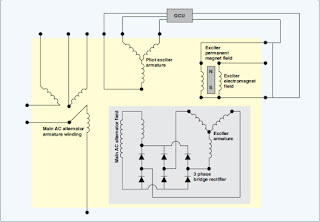 When the pilot selects the operation of an AC alternator, the GCU monitors the alternator’s output to ensure voltage and frequency are within limits. 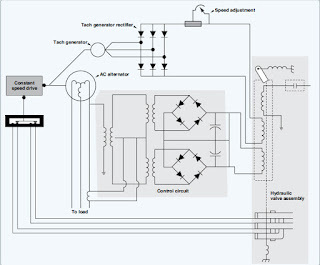 If the GCU is satisfied with the alternator’s output, the GCU sends a signal to an electrical contactor that connects the alternator to the appropriate AC distribution bus. The contactor, often call the generator breaker, is basically an electromagnetic solenoid that controls a set of large contact points. The large contact points are necessary in order to handle the large amounts of current produced by most AC alternators. This same contactor is activated in the event the GCU detects a fault in the alternator output; however, in this case the contactor would disconnect the alternator from the bus.